Loose-leaf Links is a feature where I gather together the interesting bits and pieces on sci-fi, fantasy and romance I’ve come across and share them with you over tea. Today’s tea is Lavender Tea from Lyndock Lavender Farm. 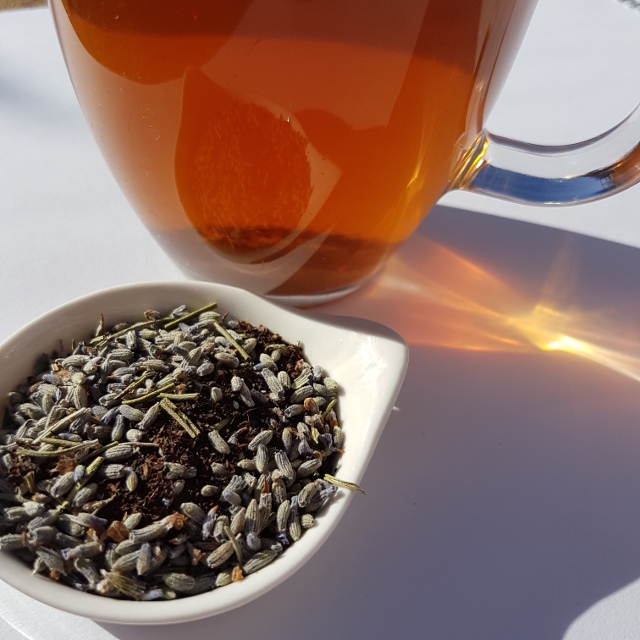 The black tea is largely hidden under the strong musk of lavender and a short brewing time is recommended. I continue to take great delight in being part of the Skiffy and Fanty team. Most recently, I had the pleasure of chatting with Tonya Moore on a recent Signal Boost episode. We geeked out over anime. I also had a very lovely chat with Thoraiya Dyer on her favourite eucalypt and the mythic influences on Echoes of Understorey. There were so many awards out over the Easter weekend that I missed a few. In addition to the Aurealis Awards and the Ditmars, SwanCon hosted the Tin Ducks–Western Australia’s award for speculative fiction. Best Professional Short Writing Work went to Stephanie Gunn, who posted about the journey behind the story. Alongside the abovementioned awards, the A. Bertram Chandler Award for service to Australian SFF fandom was also presented to Edwina Harvey. The citation is now available online. Looking beyond Australia, the 2017 British Science Fiction Awards were presented the same weekend. And, as previously reported, the Hugo shortlists were also announced. However, not everyone was happy with the timing, as reported by File 770 (see item 13). WorldCon 76 chair Kevin Roche responded but it would be generous to call it an apology to the Orthodox Jewish community, and no solid commitment was given to ensuring it doesn’t happen again. More recently, the Kitschies were presented on 9 April. Particular congratulations to Alex Wells who won the Golden Tentacle for Hunger Makes the Wolf. The Science Fiction Poetry Association has released the candidates for the 2018 Rhysling Award (though a warning the website is a bit hard on the eyes). And it’s never too early to be thinking about next year’s awards! The Aurealis Awards have put out a call for judges. The results are in for the Down Under Fan Fund race. Marlee Jane Ward will be sent to represent Australian fandom at WorldCon 76. Congratulations, Marlee Jane! Meanwhile, Australia will be welcoming Polish fan Marcin Klak to Continuum as the winner of the Going Under Fan Fund race. Speaking of Continuum, the con organisers have a list of potential panels up and are seeking panelists. Kat Clay reports on SwanCon. And Cat Sparks has photos of the 2018 Aurealis Awards. NPR reports on the lack of black women represented in romance and the RITAs… without actually interviewing a black woman. Courtney Milan apologised for giving them a loophole when she was asked to recommend interview subjects. Women in SFF Month has kicked off at Fantasy Cafe. Bogi Takacs has a new column at Tor.com about QUILTBAG classics of speculative fiction. A reminder that Galli Books also has a call out for fiction, non-fiction and poetry for a new anthology called Speculative Masculinities. Deadline is 15 April. Marie Brennan has had an excellent column on worldbuilding over at Book View Cafe. The essays have now been collected and are available as an e-book. Harry Hartog’s book store are hosting a launch for Leife Shallcross’s forthcoming book The Beast’s Heart on 26 April. Tickets are free but Canberra locals should RSVP. Last month it was Cat Rambo’s Feminist SFF book bundle. This month Lavie Tidar has curated a World SF book bundle designed to take your Mt TBR to ever greater heights. Fortunately, Dewey’s 24-hour readathon is right around the corner! Reader sign-ups are now open. Welp I didn’t know about the Cat Rambo Story Bundle, but I cracked like an egg in the face of the World SF Story Bundle. I’m so weak. It was the mention that one of the bonus books was by an African psychologist. I cannot resist SF by mental health professionals. It’s my catnip. It’s a compelling book bundle (Zen Cho! Aliette de Bodard! ), so I can’t judge you for cracking. The only thing that has kept me from doing likewise thus far is the influx of Hugo books I’ve been battling. But I suspect I’ll crack before the end. I’d love to hear your thoughts once you take a peek at the material.